This report was compiled from March through July 1997 by examining all existing CMR forms from 1925-1997 and all existing chapter history forms from 1925-1986. It was accomplished by reading each individual CMR and noting any event which seemed significant, detailing it with the month and year of the event. This forms the bulk of Part II. Once I had completed the reading of the CMR’s I went through the Chapter History Reports which yielded additional information. Secondly, I compiled my existence each year and attempted to discern what their function was. This makes up Part III. I also felt it was important to write down chapter traditions such as chapter awards. This is covered in Part VI. Finally, I felt it was important to include the raw data which showed the overall membership trend of the chapter over the past seventy-seven years, which makes up Part IV. The report began by evaluating the CMR’s from 1983-97, which were the only ones available at time (in December, 1996). When the other CMR’s were found, I thought it would be a good idea to complete the project. This involved many late nights, but in the end I feel the effort was worth it. I finished reading through all the CMR’s by the end of March 1997. In April I typed up a first draft of this report. On July 9, 1997 I completed the final revision. This report was created so that the brothers of the Michigan Chapter could gain insight into the rich history of our chapter as well as gain ideas from the successes and mistakes of the past. By learning about and applying such ideas, it is my hope that that our chapter will continue to exist as one of the finest Delta Chi chapters in the country. It also serves as a tool to remind alumni of their years as a Michigan Delta Chi. Let this document be a building block so that the history events in our chapter will continue to be reported well into the future. Though the Michigan Chapter was founded in 1892, the first local records of its existence and activities begin in the year 1920. The Chapter had lived in the former Sigma Phi Epsilon fraternity house at 733 South State Street, on the northeast corner of State and Hill streets, from 1919 to 1934. When the house was torn down in in 1995, the current chapter was able to obtain the cornerstone from the house. From 1892 to 1919 the Michigan Chapter was housed on Olivia Street, at a now unknown address. The house the chapter occupied from 1919 to 1934 was described as being in the English style, perched on a terrace overlooking the intersection. A 1931 report described the layout of the house: the basement contained a dining room, kitchen, and storerooms. The first floor contained a main hall, sun room, telephone booth, guest rooms, the porter’s room, and bathrooms. The second floor contained study rooms and showers. The third floor served as a dormitory and also contained showers. The house was owned by the Delta Chi Association, a corporation of alumni which rented the house to the chapter. In 1934, the chapter was closed due to dwindling numbers caused by the onset of the Great Depression. The chapter had accepted members from other closed fraternities during the 1930’s, but was unable to recover from a lack of membership (the all-time low of active membership is 10, in 1932 and 1933). Despite increasing initiate numbers, many of the new brothers could not meet financial commitments and were forced to leave the fraternity. 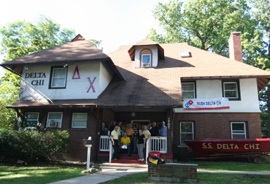 The Delta Chi Association had lost the house to creditors, as the mortgage value to the house ballooned to $72,000 (which exceeded the value of the house, lot, and furnishings combined) and the chapter became unable to make monthly payments to the Ann Arbor Trust Company. An Alumni Finance Plan was enacted to deal with financial troubles of the chapter and collect unpaid debts; the plan was successful during the late 1920’s but by 1933 it had ceased to operate and the alumni charged with helping the chapter did not meet. However, the closing of the chapter appeared to come as a surprise. The chapter had elected officers for the 1935 school year, but the house permanently closed its doors in June, 1934. Examining the records from this period allows one to gain insight into fraternity life during that time. The familiar positions of “A” through “F” were already in place. However there was also an “F minor” that assisted the “F” in his duties. The twenties saw the beginning of the Delta Chi committee system, with the positions of House Manager, Finance Committee, and Steward in place in 1925. A standing Rush committee was created in 1926, a permanent Social committee in 1927, and the Athletics chairman in 1930. The fraternity held frequent house parties, the most important of which was the J-Hop (Junior Hop), in which many girls invited by the brothers would come from out of town. The chapter held bi-monthly formal dinners. The house bought a Victoria in 1927 and its first radio in 1930. The chapter paid a rent of $300 per month nine months out of the year to the Delta Chi Association, which made rent $20 per month. In-house also paid a $32 weekly board charge. Out-of-housers paid a dues fee of $5 per month, plus a $4 parlor tax for house improvements. Chapter meetings occurred at the now-familiar time of 7PM each Monday, which was attended by 90-95 percent of members. The fraternity had a fine system, including a $1 fine for not attending chapter, a .25 fine for disorderly conduct in the chapter room, and a $5-$15 fine for not attending initiation. Delta Chi’s were also known around campus, and in 1927 Brother George Rich was elected captain of the Michigan football team. In 1932 Brother Fred Petoskey served as an All-American End on the National Championship football team, as well as the captain of the basketball team and the starting center fielder on the baseball team. Delta Chi’s were also awarded varsity letters in other sports such as wrestling. They were also active in many campus organizations. A 1928-29 report ranked Delta Chi as the 7th most prestigious fraternity on campus out of over 80 active national and local fraternities on campus. Delta Chi, as one of the oldest fraternities on campus, was awarded two votes at IFC meetings because it had been on campus for more than 15 years in 1925. Despite their notoriety around campus, membership in Delta Chi continued to shrink. One can see the shrinking of the Greek system as a result of the economic conditions of the time that eventually led to Michigan chapter’s demise. Rent was decreased to $18 a month in 1933, and initiation fees dipped from $140 to $40 in order to attract new members. In 1931 the chapter pledged not to hold any more dances until they got 3 pledges. In 1933 Delta Chi accepted members from another closed fraternity into their bond. The Greek system was also hindered by an active campaign on the part of the University administration (headed by Dean Howard Bursley) to close down all fraternity houses on campus. The chapter was also forced to accept a deferred rushing system during the 1931-32 school year due to the Depression. Finally, the Michigan chapter itself was forced to close its doors. It is also unknown how the records from the 1920’s and 30’s survived during the period of the chapter’s inactivity. There is evidence that a core group of alumni kept in touch; there is a note in a guest ledger indicating an alumni get-together in 1938. The chapter had much alumni activity during the 1920’s, such as alumni reunions, local and national founders’ day banquets, as well as homecoming. Though alumni support decreased in the 1930’s, a small group of alumni remained active in the chapter. After World War II, many young men who had served in the war were returning to universities as a result of the GI Bill. In 1947, Delta Chi International Headquarters decided that the chapter would be recolonized. A group of officers was found, and a group of alumni bought the chapter’s current house, at 1705 Hill Street (northwest corner of Oxford and Hill streets) for $13,000. The house was built during the early part of the twentieth century (sometime between 1904 and 1913). Legend says that it was built by a bishop. The first floor has remained relatively unchanged since that time. The current pool room (former dance floor/tube room) was a screened-in porch, while the living and dining rooms as well as the kitchen appear to have remained I their same location. The second floor contained a master bedroom in portions of the current Fireside and Grand Central rooms, a guest bedroom in what is now Front Triple, and a child’s bedroom in the area of Windows. The area of Middle Earth was an open-air porch. The area around South Quad was either a sitting room or another bedroom. The current Closet and Bear’s room were rooms for the house servants, as evidence by the narrow back stairway. It is unknown what the basement was like. The third floor was an open attic. During that time, the house has been altered in several different ways. The basement has several doorways that were bricked up in the boiler room and in the closet in Alaska. The second floor has several doorjambs from which one can visualize the former structure of the house. The drop ceiling in the upper foyer reveals a carved wood ceiling. There was also a step in door in the upper foyer from which one could go directly to third floor stairs. The third floor was referred to as the “warm dorm” and the room now called Middle Earth was the “cold dorm”, which referred to areas that several members in the fraternity would sleep. The chapter was reactivated on February 14, 1948. The officers were trained in the tradition ritual by the brothers at Michigan State. The Michigan chapter has had relations with other Delta Chi chapters throughout its history. There was an annual touch football game between the Michigan and Michigan State chapters during the weekend of the UM/MSU football game from the 1940’s to the 60’s. The Michigan Chapter had a hand in the formation of the Western Michigan chapter in 1955, and helped initiate and teach its new officers. The chapter had often partied with the Wayne State chapter in the 1960’s and early 70’s and it was also a popular destination for pledge walkouts. The chapter also bet skins on football games with chapters around the country from the 1940’s to the mid 1970’s. The first years of the new Michigan chapter were the most fruitful of its history. Membership climbed rapidly, reaching an all-time high of 43 active members during early 1950. This membership was bolstered by active recruitment during formal, open, and summer rush. Membership recruitment was also aided by a lengthier school year, which allowed for two initiation ceremonies in the winter semester. The chapter established itself on campus during the 1950’s by participating in a variety of campus events. The J-Hop (Junior Hop) was the most important social event during the 1950’s. The brothers would switch residences for a week with a sorority, which allowed for the women a greater degree of freedom than what was experienced in the sorority house. The week culminated in a big dance at the IM Building. Rent for the chapter was $25 a month. Despite the chapter’s growing numbers, in 1951 it reported a $2000 deficit. The chapter purchased its first television set in 1950. During that year the chapter also made newspaper headlines by receiving a live sheep as the result of a bet with Ohio State chapter over a football game. The committees at the recolonization of the chapter were Athletics, Song, Steward, Social, Rush, House Manager, and Homecoming chairmen. Each position also had an assistant which assisted them their duties. Activities also paid a parlor tax of $8 for the upkeep of the house. The executive board was expandable with the addition of the Member-at-large in 1950 and Steward in 1952. All positions were originally semester positions, with the “A” being made a full year position (February to February) in 1953 and the “C”, “D”, and “E” becoming full year positions soon thereafter. The “B” remained a one semester position until the late 1980’s, the “F” and MAL have always been one semester positions. Delta Chi during the 1950’s was known as a lively place. Planned parties took place at least once every two weeks, and then increased to once per week by the late 1950’s. There were formal dances during the fall and winter terms held at hotels in the Detroit area. There were also several sorority exchange dinners which allowed the brothers to take an active role in the Greek system. In 1949-50, Delta Chi was named the top social fraternity on campus. The Fraternity also placed well in Michigan’s festivities which were held every spring. By 1957-58 the fraternity had several sorority exchange dinners per semester, as well as athletic events with sororities. Efforts were made to establish a new core of alumni, as the first Michigan Delt was sent out during the 1949-50 school year. This was a successor to the newsletter of the 1920’s, entitled “The Tie”. The Delt was sent out anywhere from two to three times per year, and was also accompanied by monthly newsletters informing alumni of events at the chapter house. Other 1950’s Delta Chi events include a dinner visit by University President Harian Hatcher. The University was a supporter of the Greek system at Michigan up until the late 1950’s. The university, however, did issue a plea to fraternity members and pledges to not participate in any raids in 1953. The Chapter also issued a dinner invitation to Bob Hope after a performance at Hill Auditorium in October, 1953 but he never responded. The chapter was charged with hiring a cook; e meals a day were served. The prices as of 1954 were $1.75 for dinner, $1 for lunch, and .50 for breakfast. There was also a coffee hour between 10 and 11AM. The Steward, who was in charge of hiring a cook and getting supplies for them, often received a salary or a reduction in meal bills. The end of the 1954-55 school year saw the first year-end awards being awarded for chapter huminary, pledge of the year, and athlete of the year. The school year during this period extended into late May. House bills during this time were defined as $1.95/day in meals, 42.50 in social fees, $9 in dues, and $6000 in rent. 1950’s records reveal much about the way that pledge activities. The pledge Co-Coordinating committee was created in 1954 to determine pledge policy. Pledges were required by IFC to have above a 2.0 GPA, and the chapter was fined $15 on one occasion for initiating someone below a 2.00. Pledges often made pledge raids throughout the course of their pledge term, gathering objects from sororities. They had to inform the police before making a raid to avoid allegations of wrongdoing. During the term, there were mandatory “pledge critiques,” in which mandatory blackball votes were taken at 7, 10, and 13 weeks of the term. The 1959 pledge program included such aspects as fraternity and university history, studying the IFC, and a 2 week etiquette study. Pledges also had to address every active as “Mister”, and had to use the back stairs as well as wear Delta Chi beanies wherever they went. The active in charge of the pledges was called the “pledge trainer”. The name of this position was eventually changed to “pledge counselor” and then finally “associate member counselor”. Pledges were forced to endure “help Week’ which preceded initiation. During this week both actives and pledges were required to help work around the house. Pledges were required to do 48 hours of work and get 8 hours of sleep before initiation, which was held during a regular chapter meeting. This made for some long chapter meeting times. The longest chapter meeting ever, in February, 1956, lasted 10 ½ hours. There were also Junior IFC, which was made up of pledge class presidents, that operated during the 1950’s and 60’s. This is in comparison to pre-initiation activities of the 1930’s. A 1931 report describes a 5 day “probation” period in which noise was the primary hazing method. Candidates were examined by a “medical corps” and required to eat carefully. Pledges were given about three hours of sleep a night, and were required to stay up all night the final night. The chapter at this time generally paid for house improvements. The Alumni Finance Control Board helped to pay for large expenditures. The chapter did experience some trouble with brothers’ paying their bills, the University would not release the grades of those owing house bills beginning in 1957. The chapter’s accounts receivable often exceeded $500 or even $1000. The ACB set the capacity of the house at 26, and every member had to sign a contract stating that they would live out of house. A maid also hired. By the 1960’s, the Alumni Board of Trustees was meeting regularly as well as the Building Corporation, which supervised major house improvements. The chapter entered the 1960’s with a declining membership. Membership had climbed dramatically from 1948-51, and then held at a level in the high 20’s and low 30’s from 1955-59. The number of active members fell under 30 in fall 1959, a level which would not be reached again until the early 1990’s. In fall 1960, chapter membership dipped below 20 for the first time in six years. Awards such as dork, guiding light, and wedge were awarded for the first time at chapter during 1960, starting a 30 year tradition. The PW award was created in 1966. The meetings also ended with a joke, starting yet another chapter tradition. There were awards at the end of the year for all weekly chapter awards as well as others, along with joke of the year. The first officially recorded keg bought by the chapter occurred at this time. The house was ailing financially as well as a $2000 deficit was reached in 1961. The chapter sought help for its declining rush members from IHQ as well as the Michigan State, Western Michigan, and Wayne State chapters. Membership stabilized between 17 and 21 members for most of the decade. There was also a $15 house improvement tax levied against members to encourage the physical improvement of the house. House improvements were also made as the result of gifts by organizations such as the Delta Chi Mothers’ Club. Membership during the 1960’s fluctuated from the upper teens in 1960-62 to the low mid-twenties in 1962-68, then back to a near twenty in 1968-70. The high point of the decade was 26, in winter 1963 and 1967. One of the most interesting cases of a Michigan Delta Chi involves that of Howard Wiarda. Wiarda joined the chapter in 1960, and was one of many brothers having financial problems. He was one of two brothers charged in1962 with not paying house bills stemming from a dispute over a meal charge. While one of the brothers resigned themselves from the fraternity, Wiarda decided to attempt to prove himself in an expulsion trial. In May, 1963 he became the only member of the Michigan Chapter ever expelled (though there have been calls for expulsion trails on numerous occasions in the chapter’s history, this is the only one that ever actually took place). In January, 1969, the master was taken up again by the chapter for an unknown reason. The case was presented again, and after two weeks the chapter determined that Wiarda would be reinstated as a Delta Chi. Apparently he had remained involved in Delta Chi, assisting the Massachusetts Chapter, but he had not requested to be reinstated by the Michigan Chapter. The restrictions that had governed Delta Chi loosened during the 1960’s. Brothers were allowed casual visits by female visitors (as opposed to formal visits only) during certain hours of the day starting in November, 1963 (in accordance with University policy). In-house dress regulations were cancelled in 1966. The University also shortened the academic year from September to April starting in 1964. The University also celebrated its sesquicentennial in 1966 with an all-campus pillow fight. Other 1960’s events included the introduction of scholarship awards in 1962 for the highest and most improved grade point. The pool table was moved to the basement in February, 1967. The chapter, upset with lack of help with rush by IHQ, acme within one vote of becoming a local fraternity in 1969. The chapter’s financial problems continued as well; the Building Corporation refused to open the house in Fall 1969 unless all accounts receivable were paid. The chapter also acquired its current telephone number of 761-6442 in October, 1969. The chapter also hired the now-legendary J.R. Russell as cook in early 1969, a position which he would hold continuously until the end of 1978. He would return for another stint as cook in the early 1980’s. The start of the 1970’s saw the fraternity system as well as the university and country in the midst of change. The Greek system at Michigan was shrinking, and in 1970 the local IFC was $11,000 in debt. In 1971 the IFC folded and the Fraternity Coordinating Council (FCC) was founded. Unlike the IFC, the FCC often called together officials such as the President, Treasurers, Rush chairman, and Social chairman from all fraternities together to compare ideas and form strategies. The Delta Chi chapter however, endured. The chapter created a Chi Delphia chapter starting in 1971. This organization, which was an intricate part of Delta Chi, was a little sisters program whose members were often members of other sororities. In fact, many Michigan Delta Chis and Chi Delphias became married later in life. Greek Week was also started in its present form in the 1978. Delta Chi has finished on the first place team in 1986 and 1995. Membership remained in the teens and low twenties from 1970-76, and then remained in the twenties for the rest of the decade, reaching a high of 27 in fall, 1979. The fine system in place since the founding of the chapter was replaced in 1975 by a demerit system which would be in place until 1992. The house also began to be subdivided into more rooms. The subdivision of the fraternity house lowered its capacity to 24 in 1971. Today the capacity of the house is considered 22. Electricity was added to the third floor in 1975 which allowed for new rooms to be built. Private phones were installed in every room in 1979. The social life of fraternity, vibrant for most of the 1960’s and 70’s had deteriorated to the point where the chapter passed a resolution to have ,ore parties during 1979-80 school year. During the earlier part of the decade, however, chapter traditions such as the awards awarded at chapter meetings and year-end awards expanded to include such colorful awards that the Michigan Chapter will continue to grow and prosper in the coming years so that this chapter and its history may continue far into the future.